Airtel is offering data at a throwaway price to users in a bid to upgrade them to its high speed 4G network. Airtel customers are getting 1 GB of 4G data at only Re 1 in Rajasthan, where the company has 4G network. It has also expanded its 4G network to many cities after the announcement of project Leap. 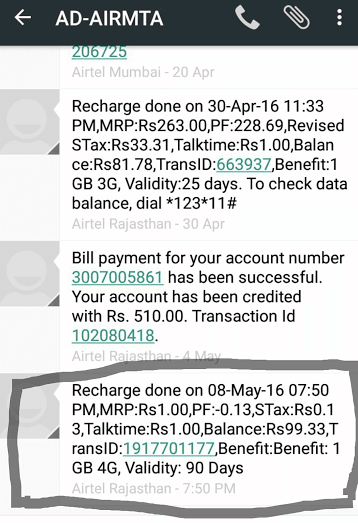 According to some of our readers, on recharge of Re 1, they are getting 1 GB 4G data for 90 days of validity. They also mentioned that this recharge works with PayTM on Airtel prepaid numbers across Rajasthan. However, the customer care did not reply to our mails on this recharge benefits. Also, upon recharging successfully the data benefits reflecting on customers account can be checked by dialling USSD codes and my Airtel apps. As no other company offers data at Re 1 ; it is an attempt to attract the larger user base so that they try its 4G network and upgrade their connection to 4G . Note: Before making the recharge please do cross check with Airtel this news is based on readers inputs. Update: Looks it was a limited period offer which seems to be discontinued now, offers like this comes and goes and this seems to be one among them . My phone is 3G and when i connect to the internet it shows”Airtel 4G”. Hey Tarun sir please tell me how to show picture in my comments. Pallab sir please visit en.gravatar.com and register ur email id that should help. Where to send such news to show on TT?